Serving Del Norte, Humboldt, Lassen, Mendocino, Modoc, Shasta, Siskiyou, Tehama and Trinity counties. 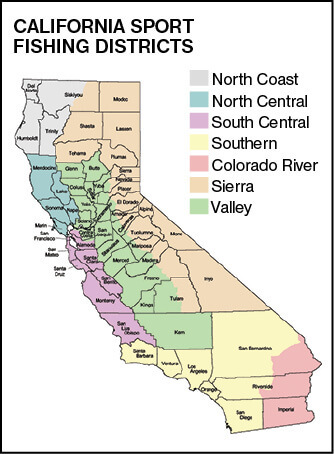 Serving Alpine, Amador, Butte, Calaveras, Colusa, El Dorado, Glenn, Lake, Nevada, Placer, Plumas, Sacramento, San Joaquin, Sierra, Sutter, Yolo and Yuba counties. Serving Fresno, Kern, Kings, Madera, Mariposa, Merced, Monterey, San Benito, San Luis Obispo, Stanislaus, Tulare and Tuolumne counties. Serving Los Angeles, Orange, San Diego, Santa Barbara and Ventura counties. Serving Imperial, Inyo, Mono, Riverside and San Bernardino counties. Licenses are not sold at this office. Serving the entire California coast, from border to border and three nautical miles out to sea. Having your e-mail address and mobile number will enable the CDFW to send you information you can use, such as license renewal and courtesy report card deadline reminders, and California fishing information. When purchasing a license from a license agent or when you log in to the Online License Service, update your communication preferences and provide your e-mail address and mobile number. 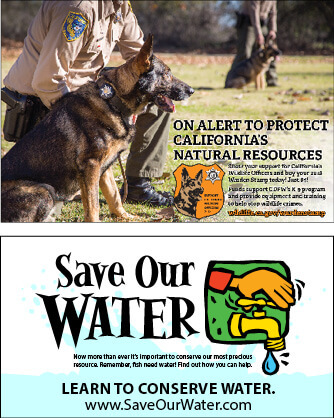 Fish and Game Code, Section 1050.6, and California Government Code, Section 11015.5, prohibit the CDFW from selling or sharing your personal information with any third party. Capture a Lifetime of Great Catches! The California Fishing Passsport is available from your local CDFW office or California Fishing Passport Stamping Agent or Sponsor.